Fittonia are mainly grown as houseplants, and with attractive foliage characterised by colourful and strongly veined leaves that are available in a number of colours. They are widely grown in containers, hanging baskets and even in terrariums. Wherever you grow them they require constant moisture, reasonable drainage and some humidity. These are a tropical to sub tropical plant and they naturally grow in filtered light, full sun will cause leaf burn fairly quickly. We are asked how big will a Fittonai grow, and the answer depends on the variety. Two main species are grown. The larger growing Fittonia gigantea, which can reach 60 cm (24 inches) in height. Deep green foliage with red veins, and purple stems. Fittonia albivenis (syn. F. verschaffeltti and F.Argyroneura) is the most commonly grown variety as it is the parent of most cultivars this is a very different plant, is is a ground cover or creeper, and is best suited to growing in hanging baskets where the foliage can be allowed to trail over the edges. Growing Medium – You will need a moisture retentive soil, however also one that drains well. Soggy wet soils will cause root problems. Position – Indoors, grow Fittonia in string filtered light, full sun will cause problems. Watering – Make sure that you keep the plants moist, water with water that has been allowed to get to room temperature, cold water can slow growth. Mist spray to maintain humidity and consider sitting the container on a saucer filled with pebbles and water. The container should sit above the water, this will improve humidity. Fertiliser – Use a 1/3 strength liquid fertiliser designed for indoor plants every 3 weeks from spring through summer. A little slow release fertiliser applied in spring will also be beneficial. Pruning Fittonia – These are a reasonably fast growing plant, to maintain a bushy compact habit, tip prune as required. It is also recommended to prune away flower spikes as they appear, this is a foliage plant and the flowers are insignificant compared to the foliage. Any spent flower spikes should also be removed. Re-potting If you need to repot your Fittonia the best time to do this is in spring. Every two years should be adequate..
Be careful when repotting and dividing as transplant shock can be an issue. A lack of water can cause wilting, this can be overcome by watering as soon as the problem arises. Over watering can also cause wilting. Overwatering can also cause leaf drop. 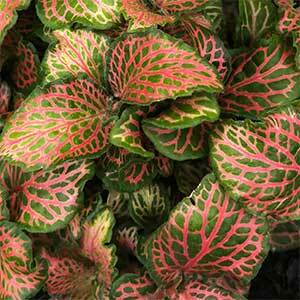 Foliage colour – Varies, greens and reds veined with silver or red.